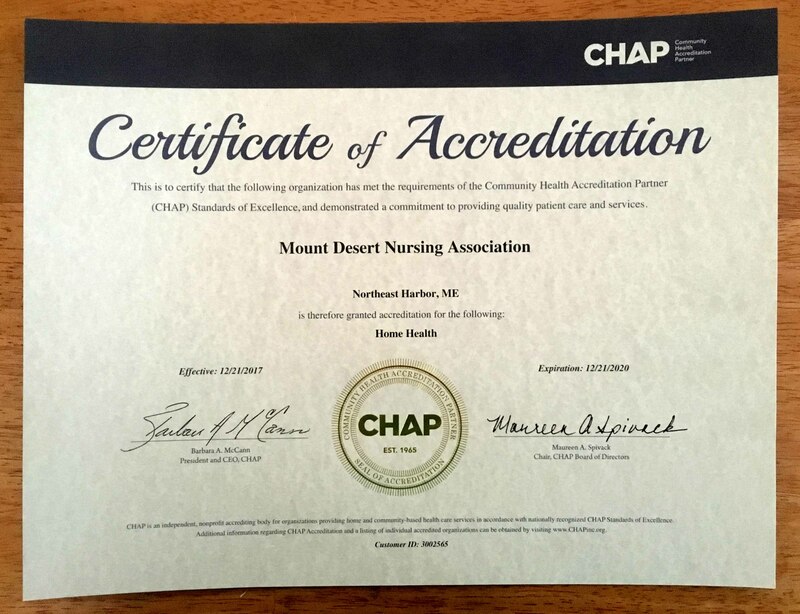 We would like to announce that the Mount Desert Nursing Association has been awarded the CHAP (Community Health Accreditation Partner) Accreditation under the CHAP Home Health Standards of Excellence and CHAP has recognized that MDNA has “demonstrated a commitment to providing quality patient care and services”. By achieving CHAP Accreditation, MDNA has also been deemed to meet the Medicare Conditions of Participation and is certified as a Medicare provider. This means that we will be eligible for Medicare reimbursement in the near future! CHAP Accreditation demonstrates that MDNA meets the industry’s highest nationally recognized standards. The rigorous evaluation by CHAP focuses on structure and function, quality of services and products, human and financial resources and long term viability. Simply stated, adherence to CHAP’s standards leads to better quality care. A huge THANK YOU to all who have supported us to make this happen!